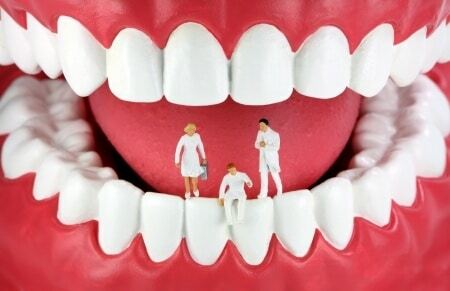 You know that your teeth are going to be adjusted, but have you ever wondered how it happens? Here is a look at the appliances, how they work and what happens at a biological level as your new smile takes shape. The movement of your teeth is performed by the dental appliances that your orthodontist will prescribe according to your particular case. Traditional brackets (the ones that most people envision when they think of braces) contain three major components. These are the building blocks for moving teeth. Made from a variety of different materials, they are bonded to each tooth with a special adhesive according to the specifications that your doctor laid out in his treatment plan. Each tooth will have a specific bracket to maximize the archwire’s ability to move that tooth to its prescribed position. Whereas the brackets might be the orchestra in the symphony in your perfect smile, it is the archwire that is the conductor. It is bent (sometimes using a computer) and placed into the slots in the brackets. Archwires do their best to move back to their original shape, which creates the needed pressure to move teeth from side to side or up and down (tip and torque). The type of wire used over the course of your treatment will change in shape and material to generate different types of pressure and movement. Round and light archwires can give way to thicker and rectangular ones throughout the treatment. Should your case or malocclusion call for added pressure or more tension in one direction or another, elastics will be fitted around some of the brackets. In certain incidences, additional device—like springs and headgear—are necessary to suit the prescribed treatment plan. As the brackets begin to move your teeth, two parts of your mouth are most affected: the periodontal membrane (also known as the periodontal ligament), which is around the root of the tooth, and the alveolar bone to which it is attached. You tooth movement depends on how the periodontal membrane and bone around your tooth react to the pressure applied by your orthodontic devices. Believe it or not, teeth respond better to a lighter force. 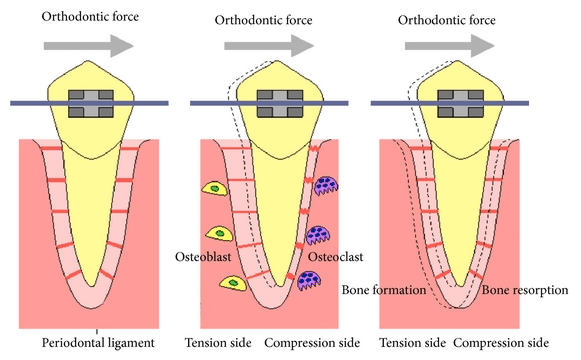 Using a gentle and constant force will cause one side of the tooth to compress against the periodontal membrane (positive pressure), which will create tension on the opposite side (negative pressure), effectively creating a space between the two surfaces. When this happens, two biological functions remodel the bone around your teeth. 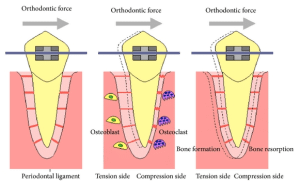 Bone-growing cells, called osteoblasts, are produced on the side where the tension is pulling the periodontal membrane away from the bone (called deposition), while on the side that is being squeezed, bone is broken down by bone-destroying cells, called osteoclasts. This is known as resorption. Resorption is fairly quick (only taking about 3 days), while deposition is a slower process, taking roughly 3 months to occur. The nature of the pressure applied to that periodontal membrane becomes important. As we mentioned earlier, light pressure is better as it regulates the rate of resorption and deposition. Too much pressure actually has the opposite effect and will slow the process down. So now you know why the average time spent in braces is 1-2 years. You also know why those extra three years orthodontists spend in training are important in helping to ensure your teeth and jaw are adjusted correctly. To learn more about how Orthodontic Associates’ expert doctors and friendly staff can help get you the healthy and happy smile you want, contact us to set up your initial consultation at any of our nine convenient locations around Baltimore. We look forward to making you smile! What do I need to know about SureSmile® Braces?